Hemorrhoids are very common in both men and women but not something people like to talk about. About 80% of adults will get hemorrhoids at some point in their lives. You are more likely to have hemorrhoids if you are older than age 50. 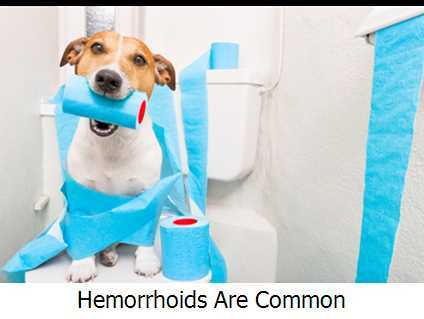 According to Mayo clinic, the leading causes of hemorrhoids are straining during bowel movements, constipation, pregnancy, and sedentary life style. Symptoms of hemorrhoids include itching, discomfort, inflammation, pain, and bleeding. However, hemorrhoids are usually not too serious and can be treated with improved lifestyle and healthy diet. Do not wait too long because the longer you wait the worst they may become. 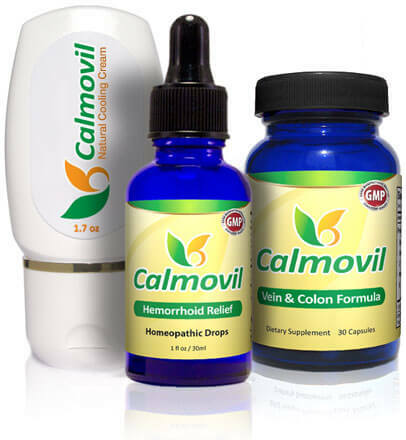 Calmovil hemorrhoid relief package contains only the best quality ingredients to work for optimal results. 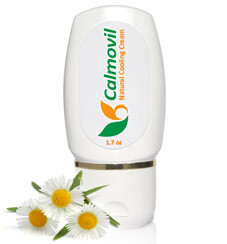 Calmovil products help to support healthy blood circulation, reduce inflammation and support healthy hemorrhoid veins. Additionally, they work to ease the pain and flare-ups associated with hemorrhoids. This Hemorrhoids Relief Kit is made for anyone suffering from common hemorrhoids. 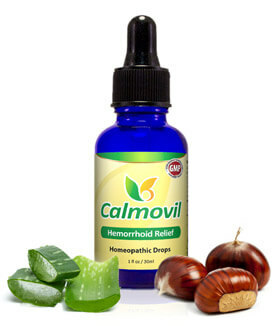 Calmovil Hemorrhoid Relief is a non-prescription homeopathic medicine, formulated with officially recognized homeopathic ingredients, as listed in the HPUS (Homeopathic Pharmacopoeia of the United States), which is an FDA-recognized compendium for homeopathic medicine. U.S. government required disclaimer: There is no scientific evidence that homeopathic products work and product's claims are based only on theories of homeopathy from the 1700s that are not accepted by most modern medical experts. Important Product limitations. 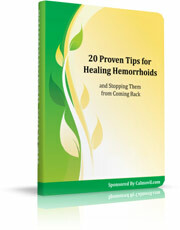 Learn 20 key tips to get rid of common hemorrhoids forever. These tips cover exercise, pain reduction, diet, what to do during flare-ups, and hygiene. This no-nonsense eBook comes as a bonus when you order Calmovil today. A must-read for those who want to put an end to common hemorrhoids today. If you use our products diligently and follow the advice in our eBook, you will notice an improvement in less than a week. We want to make our customers happy and healthy, and that's why we offer a 60-day money back guarantee. Our promise is simple: If you are not absolutely amazed by the improvement, return the open bottle for a full refund! Manufacturing safe products is our #1 priority. 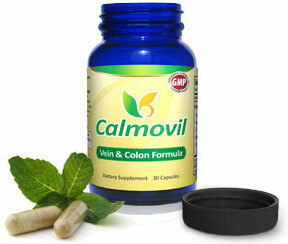 Calmovil™ products contain only natural plant and herb extracts that are generally considered safe. Our customers have been using Calmovil products for many years, and so far no adverse events (side effects) have been reported. As is the case with other dietary supplements you should not use Calmovil products if you are nursing or pregnant because the effects on fetus have not been determined. You should not take Calmovil Vein & Colon formula if you are taking blood thinning medication or have a bleeding disorder. 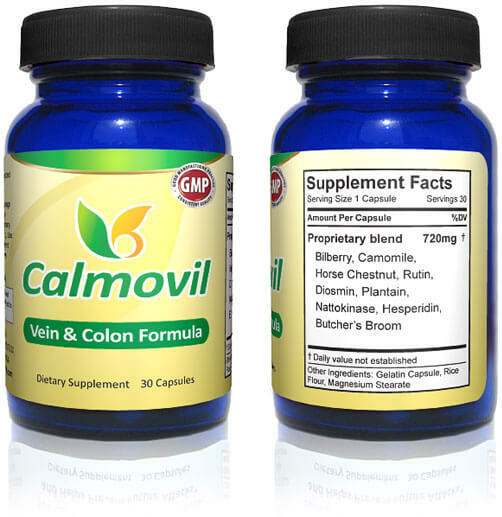 As an herbal supplement, Calmovil's Vein & Colon Formula contains natural ingredients from plants, trees, and herbs. Most other supplements contain a few bioflavonoids, and you need to consume a lot of capsules to achieve proper benefit. Calmovil supplement delivers a powerful dose of 240 mg of a pure Hesperidin, diosmin, and rutin bioflavonoid blend in only a single capsule. Calmovil supplement is the only product that contains Nattokinase enzyme, ensuring proper blood flow.